Singapore, as a financial hub and a long-standing trading post of Indians, will be the spring board to markets in ASEAN and the broader RCEP covering Asia Pacific countries and China. The Indian High Commission in Singapore has started India Week with more than 100 export-oriented micro, small and medium enterprises with a business seminar to boost exports. The India Week was organized by Singapore event company De Ideaz while the Indian MSMEs were brought by the Federation of Indian Export Organizations. “India’s trade with ASEAN Region was below potential, was showing a modest growth and constituted about 2.5% of ASEAN’s total trade,” India’s High Commissioner to Singapore, Jawed Ashraf, said on 26 Jan 2019 of the events being hosted during India Week. To support further growth in trade, the High Commission organised “India-Singapore Trade: Sustainability, Strengths and Strategies – Making it Work for Smaller Businesses” on 25 Jan 2019. The seminar promoted exports from micro, small and medium scale sector, handicrafts and cottage industry, including Khadi products from India. These products bear the “unmistakable stamp” of India’s culture, traditions and skills. “This was also linked to the celebration of 150th birth anniversary of Mahatma Gandhi with year-long activities and events, given Mahatma Gandhi’s strong advocacy and support for these sectors of our economy,” said Jawed Ashraf. India Week also hosted a series of events covering culture, art, cinema, cuisine and philosophical discourses. These provide consumers a total experience and contextualises the Indian products at events such as the annual Singapore Indian International Expo. “We also had the presence of Indian artisans (at the India Week), who demonstrated how their products are made,” said Jawed Ashraf who hosted the Indian Flag and a reception for 1,200 Indians in Singapore at the Republic Day Celebration on 26 Jan 2019. The High Commission would like to help grow India Week, along with Singapore International Indian Expo, into a major platform for traditional Indian exports not just to Singapore, but also to the ASEAN Region. 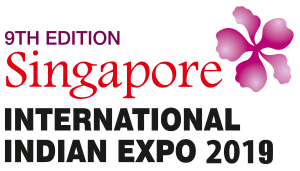 The Expo is organized De Ideaz with Singapore Press Holdings’ Tamil newspapers – Tamil Murasu and Tabla! The Indian Government has taken a number of steps to create an enabling environment for exports from small and medium enterprises, including improved logistics, trade facilitation, ease of doing business, lower corporate taxes, major improvements in and relief under the GST regime, concessional finance, quality assurance and certification and market support. Pointing out the Government’s trade promoting initiatives, he noted that the India-Singapore trade lagged behind engagement in other areas, including political, defence, innovation and investment, besides people-to-people and cultural links. An energized campaign has started with India Week to boost trade with the ASEAN and RCEP markets. Citing the potential of these markets, Jawed Ashraf wants to see Indian companies build on these Indian Government supported enablers and expand the export-oriented companies’ footprint the ASEAN markets, including Singapore as a regional gateway.